Royal Mail set to pay tribute to the rock legends with a limited edition issue of stamps this summer. 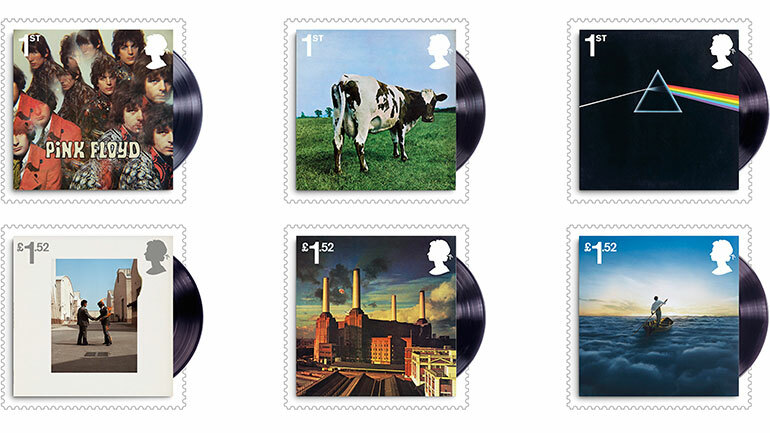 PROG ROCK WILL meet ‘post’ rock this summer as Pink Floyd star on a set of British stamps. Issued by the Royal Mail from July 7, a selection of the band’s album covers plus four live shots will grace the ten-strong special edition. The Piper At The Gates Of Dawn, Atom Heart Mother, The Dark Side Of The Moon, Wish You Were Here, Animals and The Endless River are the album sleeves you’ll be able to stick on your letters, while the live scenes include iconic shots from London’s UFO Club in 1966 and stage sets for The Wall and Division Bell tours. It’s not quite Pink Floyd’s mail debut, as The Division Bell’s artwork featured as a stamp as part of a 2010 edition that celebrated classic album covers, but it is the first time the band have had an entire edition to themselves. Complete sets of the stamps will be accompanied with notes written by MOJO’s Editor-In-Chief Phil Alexander. The stamps can be pre-ordered now via www.royalmail.com/pinkfloyd, otherwise they’ll be available from all good post offices in the UK after issue date. Boogie With T.Rex, And Philips!